In the Press Release of the President of the Malaysian Bar, Christopher Leong on 15 January 2015, he on behalf of the Bar Council asserted a defence of Eric Paulsen of Lawyers for Liberty (LFL) for his tweet “JAKIM is promoting extremism every Friday. Government needs to address that if serious about extremism in Malaysia” and urged the authorities to cease the use of the Sedition Act 1948. The Centre for Human Rights Research and Advocacy (CENTHRA) and Concerned Lawyers for Justice (CLJ) denounce these stands. Whilst we concede that public authorities must be subjected to reasonable criticism and are not beyond reproach in the discharge of their duties, weurge the Bar Council not to mislead the public by repeating and defending his assertion that his criticism was not directed at Islam in particular but rather JAKIM as a government agency. As stated in our Press Statement of 12 January 2015, we note that Eric Paulsen’s offending tweet is but his latest in a litany of tweets all directed against and calculated to undermine the position of Islam as enshrined in the Federal Constitution as well as provoking racial and religious discord amongst a section of the Malaysian Muslim community andthere is ample evidence in this regard. 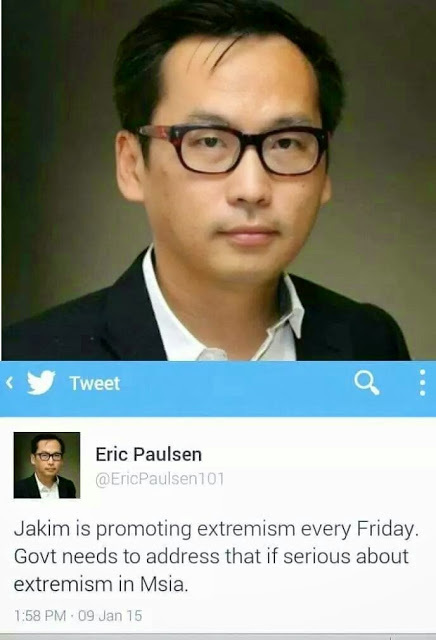 We note, however, that there is yet no evidence as to sermons by JAKIM promoting extremism every Friday as claimed by Eric Paulsen. We furtherbelieve that the Bar Council possesses knowledge of prior offending tweets by Eric Paulsen in this regard, and of his failure to provide evidence to substantiate his assertion, especially since such knowledge being public in nature and thus common to all. That the Bar Council knowingly adopts and promotes Eric Paulsen’s own false defence of his offending tweet in spite of this common knowledge and lack of clear, tangible evidence in support of his outrageous claim is devious to say the least, and sullies further the reputation of the legal profession in the eyes of the Malaysian public. On the Sedition Act, while the Bar Council has adopted a stand against the further use of the Sedition Act 1948 exemplified by its resolution of 19 September 2014 calling for the abolition of the Act, and its so-called Walk for Peace and Freedom and its memorandum to the authorities on 16 October 2014 supporting the repeal of the Act, we urge the Bar Council to take cognizance of the conclusion of the national debate as to the relevance of the Act in these times, and respect the clear will of the majority of the Malaysian citizenry desiring the Act’s continuance. The Bar Council must therefore cease itsopposition to the continued existence of the Sedition Act 1948 on the Malaysian statute book, and support its continued application and efforts to strengthen its provisions. We therefore reiterate our call upon the Bar Council to cease immediately its defence of Eric Paulsen and take appropriate disciplinary action against him under the relevant provisions of the Legal Profession Act 1976 as well as the Legal Profession (Practice and Etiquette) Rules 1978 for making seditious tweets in his capacity as a legal practitioner. We further reiterate our call upon the Bar Council to immediately revoke its resolution of 19 September 2014 calling for the repeal of the Sedition Act 1948, disavow its so-called Walk for Peace and Freedom and memorandum to the authorities on 16 October 2014 further calling for the abolition of that Act, and to wholeheartedly as well as unreservedly support all laws designed to protect and maintain the Federal Constitution as well as racial and religious relations within Malaysia. January 22, 2015 in Sedition Act.